This is a 20 lb. 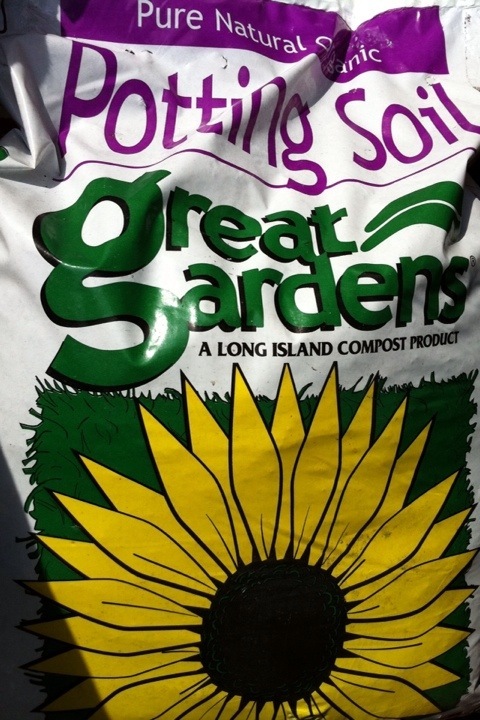 bag of organic potting soil from Long Island Compost. $2.99/bag at my local cheapo kinda dollar store, one of many on Church Ave., Kensington side. Of course I love the sunflower but the question is how’s the dirt in the bag. I will report back, and give U the dirt! I just heard a podcast about buying dirt. They put the bags flat side by side in the garden. Cut the plastic off the tops leaving it intact around the sides to contain the dirt. Punch a lot of holes through the dirt into the ground so excess water can drain into the ground. Plant away. They said you can start a new garden patch this way since the bags will kill everything under them. The new dirt should be fertile to grow in, and the next year you pull out all the plastic and leave the soil in place. You can repeat the process the following year with the bags or just grow normally once you pull out the plastic. It’s also a quick cheap way to make a raised bed. One guy planted water melons in a bag of good soil similar to the above and got a great crop.